Ht / Wt: 6'6" / 255 lb. 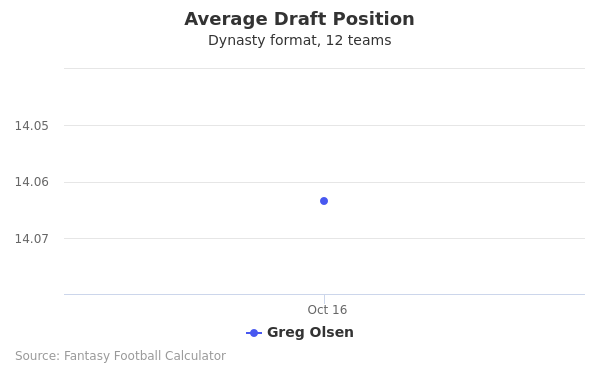 Greg Olsen's fantasy value is measured by his average draft position (ADP) in fantasy football mock drafts. 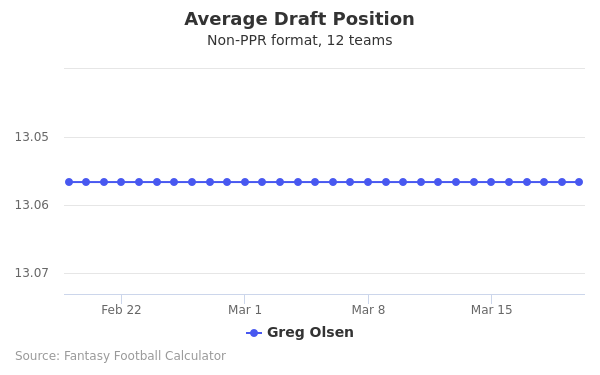 In recent drafts, Olsen's current ADP is 13.12, which indicates that his fantasy outlook is to be the 12th pick of the 13th round, and 155th selection overall. 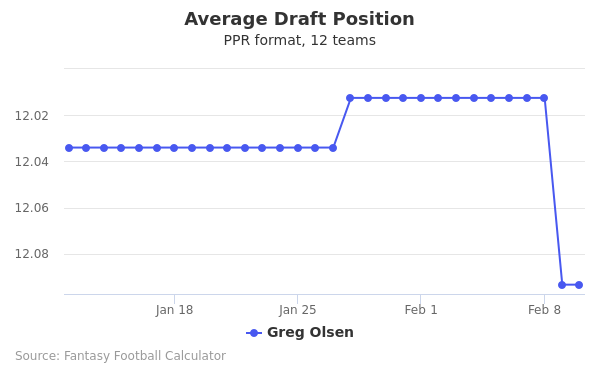 The code below will display a graph that updates every day to show the ADP data for Greg Olsen for the past 30 days in 12-team PPR leagues. Draft Greg Olsen or Tre'Quan Smith? Draft Austin Seferian-Jenkins or Greg Olsen? Draft Greg Olsen or Kalen Ballage? Draft Darrell Henderson or Greg Olsen? Draft Greg Olsen or Ronald Jones II? Draft Greg Olsen or Ted Ginn Jr? Draft Greg Olsen or Jordan Reed? Draft Giovani Bernard or Greg Olsen? Draft Greg Olsen or New England Defense? Draft Derek Carr or Greg Olsen? Draft Chris Herndon IV or Greg Olsen? Draft Greg Olsen or Quincy Enunwa? Draft Greg Olsen or Marquez Valdes-Scantling? Draft Greg Olsen or Matthew Stafford? Draft Greg Olsen or Nick Foles? Draft Greg Olsen or Jack Doyle? 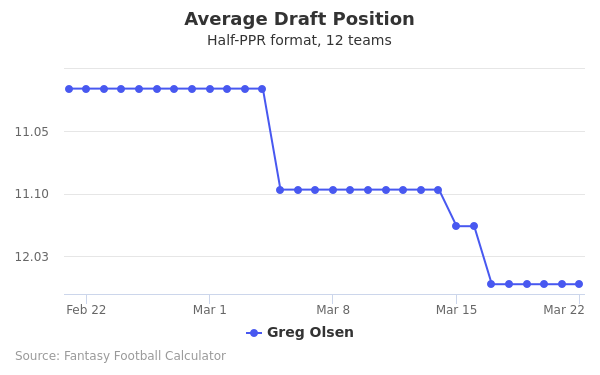 Draft Greg Olsen or Nelson Agholor? Draft Greg Olsen or Jalen Richard? Draft AJ Brown or Greg Olsen? Draft Damien Harris or Greg Olsen? Draft Greg Olsen or Sam Darnold? Draft Greg Olsen or Philadelphia Defense? Draft Greg Olsen or Noah Fant? Draft Greg Olsen or Robbie Gould? Draft Adam Vinatieri or Greg Olsen? Start Greg Olsen or Tre'Quan Smith? Start Austin Seferian-Jenkins or Greg Olsen? Start Greg Olsen or Kalen Ballage? Start Darrell Henderson or Greg Olsen? Start Greg Olsen or Ronald Jones II? Start Greg Olsen or Ted Ginn Jr? Start Greg Olsen or Jordan Reed? Start Giovani Bernard or Greg Olsen? Start Greg Olsen or New England Defense? Start Derek Carr or Greg Olsen? Start Chris Herndon IV or Greg Olsen? Start Greg Olsen or Quincy Enunwa? Start Greg Olsen or Marquez Valdes-Scantling? Start Greg Olsen or Matthew Stafford? Start Greg Olsen or Nick Foles? Start Greg Olsen or Jack Doyle? Start Greg Olsen or Nelson Agholor? Start Greg Olsen or Jalen Richard? Start AJ Brown or Greg Olsen? Start Damien Harris or Greg Olsen? Start Greg Olsen or Sam Darnold? Start Greg Olsen or Philadelphia Defense? Start Greg Olsen or Noah Fant? Start Greg Olsen or Robbie Gould? Start Adam Vinatieri or Greg Olsen? Greg Olsen currently plays as a tight end for the Carolina Panthers. He wears jersey number 88. Olsen was born in Paterson, New Jersey, and grew up in nearby Wayne Hills, New Jersey, where he played on the local high school’s football team that his dad coached. He finished his career with 73 catches for 1,474 yards and a record 27 touchdowns. He was named as a finalist for the Gatorade Player of the Year award and was chosen as a First-Team All-American by the USA Today newspaper. He was also a member of the 2003 U.S. Army All-American Bowl squad before entering college. He was rated as the second-best tight end prospect in the nation coming out of high school in 2003. Olsen’s college career started at the University of Miami after transferring from the University of Notre Dame during the early fall of 2003. He was assigned to University of Miami Hurricane’s football scout team where he suffered a shoulder injury. Olsen spent the rest of the year as a redshirt freshman. Olsen got to start the following year. He ended up catching 87 passes for 1,215 yards with six touchdowns during his career with the Hurricanes during the 2005 and 2006 seasons. Olsen was rated by scouts as the number one tight end entering the NFL draft and the 24th top rated player overall. He was chosen by the Chicago Bears with the 31st pick in the draft. Olsen suffered a knee injury in the final preseason game of his rookie year and was sidelined until the third week of the season. He made his first start against the Dallas Cowboys and had two catches for 28 yards. He caught his first career touchdown during the fifth game of the season against the Green Bay Packers. He finished the season with 39 catches for 391 yards with two touchdowns. Olsen’s second season with the Bears was more productive as he got to start in seven games. He had 574 yards on 54 catches with five touchdowns. Olsen was named to the Pro Bowl team as an alternate. The third year with Chicago was even better for Olsen as he caught 60 passes for 612 yards with eight touchdowns to lead the Bears in catches and touchdowns. His fourth year was a little disappointing as his numbers dropped to 41 catches for 404 yards with five touchdowns. He was traded after the 2010 season to the Carolina Panthers. Olsen’s number picked up a little bit after arriving in Carolina in 2011. He caught 45 passes for 540 yards with five touchdowns. Through the next three seasons, Olsen had a combined 223 catches for 2,667 yards with 17 touchdowns as Carolina’s regular season record was a combined 26-21-1. In 2015, Carolina signed Olsen to a new contract worth an annual salary of $7.5 million over the next three years. Olsen responded by having 77 catches for 1,104 yards and seven touchdowns. He added another 16 receptions for 231 yards and one touchdown as the Carolina Panthers made it to the Super Bowl that year where they lost to the Denver Broncos 24-10. Carolina followed the Super Bowl season with a subpar performance, but Olsen still did his part by catching 80 passes for 1,073 yards with three touchdowns. Olsen still remains strong and is expected to be a valuable member of the Carolina Panthers for the foreseeable future. You can follow Olsen on Twitter and Instagram. Both addresses are @gregolsen88.